In most states, cities may assess franchise fees on electric and gas utility bills within their boundaries. Fees are assessed on the bills of customers of private companies, not usually customers of cooperatives or city-owned utilities. Typically, a franchise fee recoups the cost of the utility companies’ use of public space––also called public “right-of-way”––for energy infrastructure such as power lines or gas pipelines. In recent years, cities have considered using utility franchise fee revenue for activities to reduce energy use and promote renewable energy. A 2017 news story from the Norman Transcript newspaper in Oklahoma explains how franchise contracts work, in general. Can Your City Use Franchise Fees? The American Public Works Association has published a guide for cities to identify their public right-of-way powers and how to implement a franchise agreement. ILSR has compiled a map, below, showing which states allow cities to assess franchise fees on utility bills (for links to sources, by state, scroll to the bottom). The map shows states where cities can have franchise fees, but omits one element: whether cities have the authority to set the fee level. In several states––Alabama, North Carolina, Maryland, and Hawaii––local governments collect the fees but the state government sets the rate. ILSR was unable to find definitive information on municipal authority for all 50 states. Minneapolis, Minn., stands out as the most innovative user of the franchise fee in recent years. As its existing franchise contract with private, monopoly electric and gas companies Xcel Energy and Centerpoint Energy wound down in 2013, the city began an exploration of its legal options to accomplish Climate Action and local energy goals. In an “Energy Pathways” study (summary slideshow), the city explored the leverage of forming its own, city-owned utility (testing the sway of the “birch rod,” as President Franklin D. Roosevelt famously called the flexing of local authority in his 1932 “Portland Speech”). 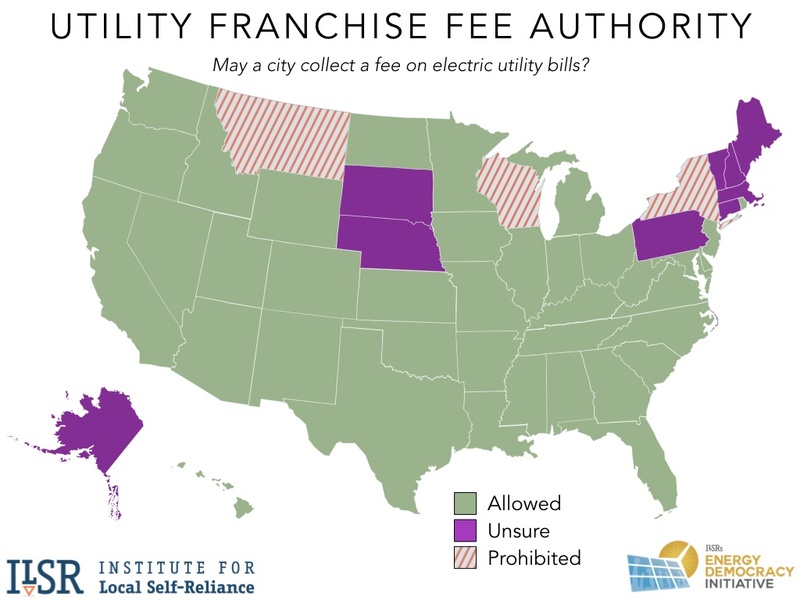 In this 2014 blog post, ILSR discussed how cities like Minneapolis, Minn., or Edmonton, Alberta, could use franchise fees to support clean energy development. This post describes how a city used its franchise contract negotiations to advance its Climate Action Plan. Instead of forming its own utility, the city opted to sign a new franchise contract and in doing so created a novel Clean Energy Partnership with its incumbent utilities establishing a shared commitment to meet the city’s climate and energy goals. The Partnership includes two representatives from each entity (two city council members, and two staff from each utilities). In 2017, the city increased its existing franchise fee on utility customers by 0.5 percent, directing the fee revenue toward initiatives to reduce energy bills and greenhouse gas emissions of the city’s residents and businesses. 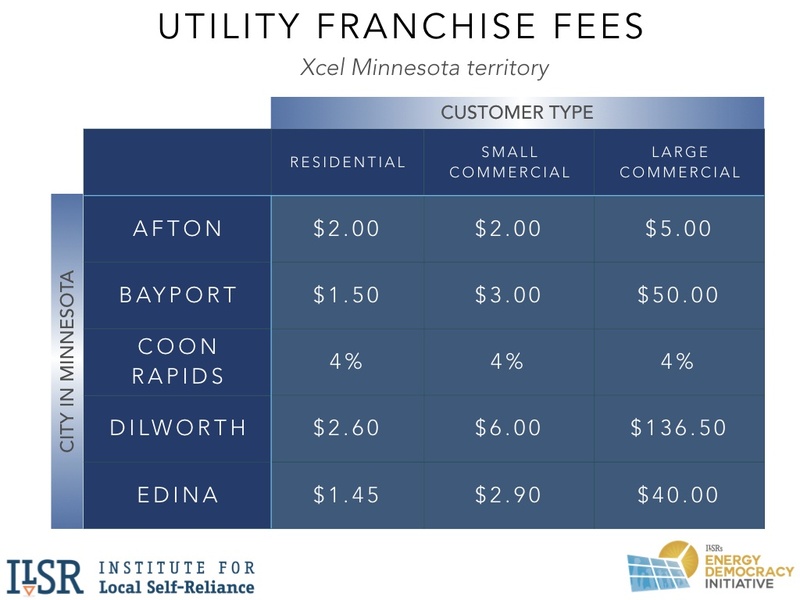 City franchise fee revenues in Minneapolis have been used as partially matching grants for energy improvements for residential or commercial customers, to buy down loans for customers in “Green Zones” (with lower-than-average household income), and to try novel methods of community engagement. Other Midwest cities also assess franchise fees, including over 150 Iowa communities, according to the Iowa Utility Association. Many Illinois communities have received free electricity or gas for city operations in lieu of payments. The municipality receives free utilities in lieu of a fee. An annual fee based on gross sales. In ILSR’s nationwide research, it anecdotally seemed that most cities levying franchise fees used model #2. The 2009 study also noted that only one city (of those studied)––Ann Arbor, Mich.––had a franchise agreement including provisions for renewable energy. In particular, the franchise required the utility to provide at least 10% renewable energy by the fifth and final year of the contract. ILSR was unable to find an example franchise agreement from any other city with a similar provision. Update 11/29/18: Unfortunately, fees charged by monopoly utilities on third parties and changes to Michigan state law invalidated Ann Arbor’s franchise agreement, and no fees have been collected in several years. States may limit the power of localities to pursue such goals via a franchise, however. When Minneapolis negotiated its franchise contract renewals in 2014, for example, state law precluded including similar requirements in the contract. Cities interested in flexing their franchise muscle should search their state laws to identify the extent of their franchise authority. How Can Franchise Fees Help Climate and Energy Efforts? If a city retains powers like Ann Arbor, it may be able to directly negotiate clean energy outcomes with its utility. If not, the city can identify ways to spend its franchise fee revenue to boost local climate efforts. Reduce the cost of clean energy with direct subsidies, matching grants, loan subsidies, or subsidized home energy assessments. Expand use of utility energy efficiency and renewable energy programs through community engagement initiatives, particularly focused on communities that are underserved, such as people of color, immigrant communities, or renters. Expand access to money upfront for energy improvements by reducing perceived lender risk with inclusive financing mechanisms, such as a loan-loss reserve or loan interest-rate buydown. Increase coordination of city departments on energy-related activities, such as combining rental licensing or home inspections with opportunities for energy services. Improve understanding of the equity of utility energy programs by gathering data on both energy poverty in city neighborhoods and who existing programs reach or serve. Examine city databases such as building permits to identify buildings that have aging energy appliances, such as furnaces, to target with programs for efficient upgrades. Map building rooftops to allow residents and businesses to see if their building is suitable for solar energy. For more information, check out this blog post on franchise fees as an oft-overlooked strategy, or this one telling the story of Minneapolis using its franchise contracts for leverage, or this press release about the franchise fee increase in Minneapolis. For other city-level tools to advance local, clean energy, see ILSR’s interactive Community Power Toolkit. For more information on which states grant cities and communities more authority over their energy future, see ILSR’s Community Power Map. Franchise fees are collected in Indiana, Michigan, Ohio, Colorado, Wyoming, North Dakota, Idaho, Utah, California, Oregon, Washington, Nevada, Arizona, New Mexico, Oklahoma, Kansas, Texas, Missouri, Arkansas, Louisiana, Kentucky, Virginia, West Virginia, Georgia, New Jersey, Tennessee, Mississippi, Florida, South Carolina, Delaware, and Rhode Island. Fees are also collected, but set at the state level, in Alabama, North Carolina, Maryland, and Hawaii. Franchise fees are not allowed in Wisconsin, Montana, or New York (looks like a special property tax instead). ILSR was unable to determine the existing of or authority to set franchise fees in South Dakota, Nebraska (all utilities are public), Pennsylvania, Massachusetts (franchise yes, fees no? ), Vermont (seems like no), Connecticut (studied? ), New Hampshire, or Maine.